Getting the facts right is the bedrock of Journalism. To my disappointment, but not my surprise, I read this short news report today in the Cincinnati Enquirer. 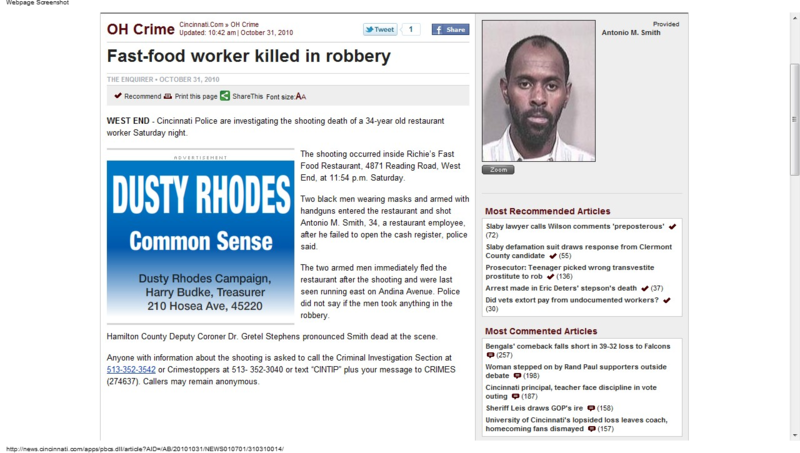 This story reports the tragic murder of a Restaurant worker. That isn't the problem. The problem is with the location listed: "West End." 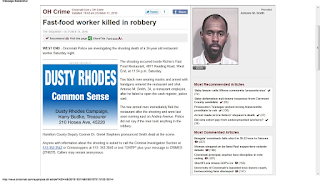 It is exacerbated later in the article when the address of the incidence is listed: "The shooting occurred inside Richie’s Fast Food Restaurant, 4871 Reading Road, West End, at 11:54 p.m. Saturday." I did a Google Search for "4871 Reading Road, Cincinnati, OH" and the first thing that comes up is a map link for Richie's Fast Food Restaurant and a small map with a pin signifying the Restaurant's location right above a label on the map indicating it is located in Bond Hill. The West End and Bond Hill are miles apart. It took me longer to write this blog post then to determine where this incident took place, Google is actually quite fast. Does this change story? Not really. It doesn't ease the pain of the family and friends of murder victim or help the Restaurant Owner overcome the robbery . One thing it does hurt, is the public's knowledge and perspective in trying to catch the criminals responsible. The article ends with information on how to contact Crime Stoppers with information on the crime. Well, for those who read this story may now be confused as to where this crime took place and may be less likely to report something they may have seen near the location of the crime. With that in mind, the Writer and the Editors need to do better and know the City. They should know that while Reading Road winds through many neighborhoods in the City, the West End isn't one of them. Fact Checking is a lost art in the online newspaper world. I really hope the Enquirer can do more of it and maybe after reading this post, they may update the article.